Today started wet, developed into cloudy, ended sunny. 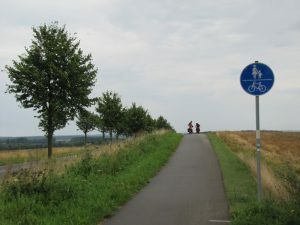 More solid cycle paths along country roads, with variable provision in the villages. After 3 days of such wide open spaces, it then came as a bit of a shock to arrive in Kühlungsborn. Ah well. It got us out of the hotel and away from this iPad!